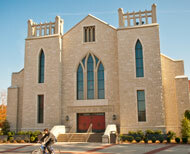 John Brown University at Siloam Springs, founded in 1919, serves more than 2,100 students from almost 40 nations. The university is an independent Christian institution with no denominational affiliation. Numerous campus improvements have taken place in recent years, including an engineering and construction management facility, technology center, performing arts center and arena. The capital campaign known as “Keeping Faith” concluded one year ahead of schedule and $18 million above the original $100 million goal. “We have called this campaign ‘Keeping Faith’ because we see these projects as a strategic way to keep faith with the past, present and future of JBU’s Christ-centered educational mission,” Pollard says. The university, founded by evangelist and publisher John Elward Brown, began as a high school and junior college that emphasized vocational training for poor young people. It evolved into one of the nation’s top liberal arts universities while forging close ties with business titans such as Sam Walton. Brown converted his 300-acre farm at Siloam Springs into a campus for what first was known as Southwestern Collegiate Institute. That was later changed to John E. Brown College and eventually JBU. Brown summed up his educational philosophy in the slogan “head, heart and hand,” which has been used since the 1920s. After Brown’s death in 1957, leadership of the school shifted to his son, John Brown Jr. In 1979, John Brown III assumed the presidency, and the school passed the 1,000 enrollment mark in 1991. Lee Balzer became president in 1994 and was succeeded by Pollard in 2004.